Hope and her 3-week-old daughter, Scarlett in Panama City. 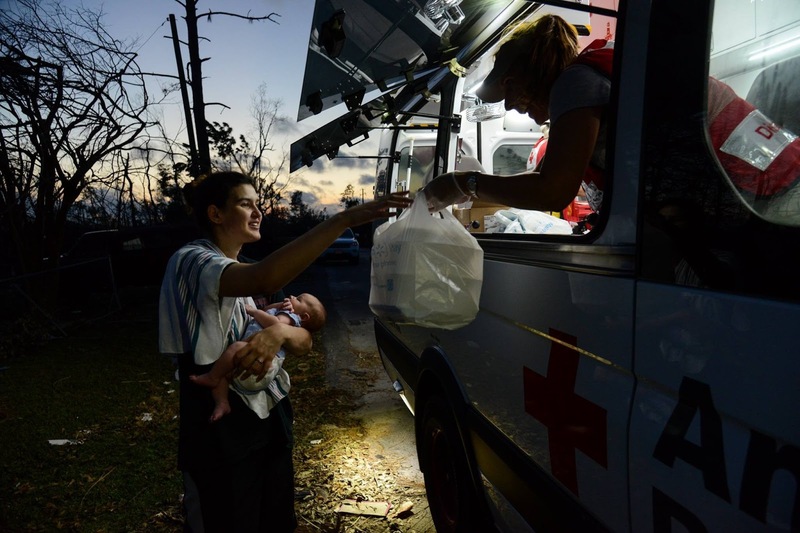 Red Crossers are working around the clock to provide safe shelter, hot meals, emotional support and so much more to the thousands affected by Hurricane Michael. Our Regional CEO posted a special thank you to a group of volunteers in Tallahassee, Fla.
Our Communications Officer Mike de Vulpillieres who recently traveled to North Carolina to help document the work of the Red Cross following Hurricane Florence shared a story about a woman he met in Fayetteville, Sonja Graham, and her recovery process. On Friday, 11 members of our FDNY DART team left for Florida to support Hurricane Michael relief efforts. Several of these volunteers had just returned from North Carolina where they helped residents impacted by Hurricane Florence only to head back out for another multiple-week deployment. MIRA USA and Council Member Daniel Dromm teamed up to offer disaster preparedness training to residents in Jackson Heights, N.Y.
Councilman Justin Brannan partnered with the Red Cross to offer free smoke alarms to anyone who needs them. Red Cross superstar Joe Spaccerelli shared his best practices for preparedness with top emergency managers from across the country on Thursday at a conference hosted by NYC Emergency Management..
Our Sr. Director of Government and Community Relations John Waldman met with Councilman Keith Powers on Monday and Councilman Alan Maisel on Tuesday to strengthen our partnerships to more effectively deliver vital emergency preparedness education and training. On Monday Red Cross wished a Happy 10th Red Cross Anniversary to Ronnie G. Rigos! Thank you for everything you do for this organization, Ronnie! We could not do what we do without volunteers like him! Oct 22, 23 & 29: Red Cross blood drives will take place from 2 to 7 p.m. at the Greater NY Red Cross building located at 520 West 49th Street, Manhattan. Schedule an appointment to donate today! Oct 25, 27: “Sound the Alarm” fire safety smoke alarm installation events are coming to Long Island on Oct 25 (in partnership with PSEG Long Island) and in Newburgh on Oct 27. Nov 4: The deadline for signing up for the Marathon Medical Spotter Team has been extended to Oct 23. The Spotter Team will monitor marathon runners in the post finish walk-off area and accompany those needing medical assistance to the nearest medical tent. Spotters MUST attend a “Hand-Only CPR” session to prepare for the event, and have a Red Cross ID. Active Red Cross volunteers can sign up on Volunteer Connection here.